Birmingham City Council is once again attacking its workers. Last year it was the bin workers, now it's coming for home care staff. But the carers are fighting back. 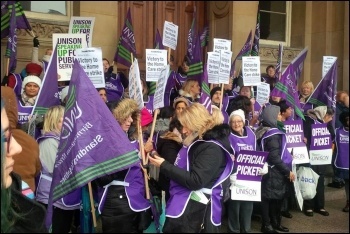 14 days of strike action have begun by the carers' union Unison in a massive show of strength to stand up for their jobs, terms and conditions and the vital public service relied upon by many families in Birmingham. A further £3 million is being cut from the enablement service budget. Part of the council's proposals is to make all full-time staff redundant and offer them new contracts for either 23, 21 or 14 hours. How are low paid workers meant to live on 14 hours a week work? These cuts are despite the council previously making huge cutbacks through 'voluntary redundancies', which were over-subscribed by a large margin and meant to solve the issue of funding. But it seems to have been just the first wave of attacks - not that anyone believed this lie in the first place. The council is shutting 14 nurseries to 'save' £160,000 but it spent £6 million on scab labour to try to break the bin strike last year! £258 million of planned cuts over the next four years shows that no council service is safe. Yet the council has approximately £400 million in useable reserves. At the same time the council is spending £12 million on consultants to tell it how to merge the home care service with NHS services in 2019-20, which is likely preparation for privatisation of both services. These cuts emphasise the need to organise a fightback at the first sign of any attack or else before long nothing will be left of our public services. Birmingham is destined to host the Commonwealth Games but can't afford its most vital public services for the families and services users of the city. The games are being pushed and used as a vanity project by a Tory West Midlands mayor - with a Chief Executive for the 2022 organising committee being hired on £170,000 a year - £680,000 in total! Socialist Party and Socialist Students members visited the four pickets organised by the home care workers on 1 August to show solidarity and offer support, which was welcomed. The mood on all the pickets - Suffolk Street, Lifford House, Woodcock Street, Lancaster Circus - was a determination to see this industrial action through to the end. Support for this strike has been flooding in from service users, their families, trade unions, disabled rights groups and other ordinary people as everyone knows the importance of the home care and enablement service. The Labour-run council has ignored the popularity of Jeremy Corbyn's anti-austerity message, as shown by voters in the 2017 general election. Instead, the council is continuing to do the Tories' dirty work by implementing cuts and attacking workers. Now that the councillors feel 'safe' for another four years, they carry on acting like Tories in all but name. Councillors could refuse point blank to carry out any cuts and instead use the reserves while working with, instead of against, unions and communities to build a campaign to demand the money from the Tory government to meet the needs of Birmingham. Jeremy Corbyn should pledge to restore those funds upon election of a Labour government. The unions should also call for deselection of Labour councillors who carry out cuts, to hold to account those who go against the unions and their members. Kick out the Blairites! 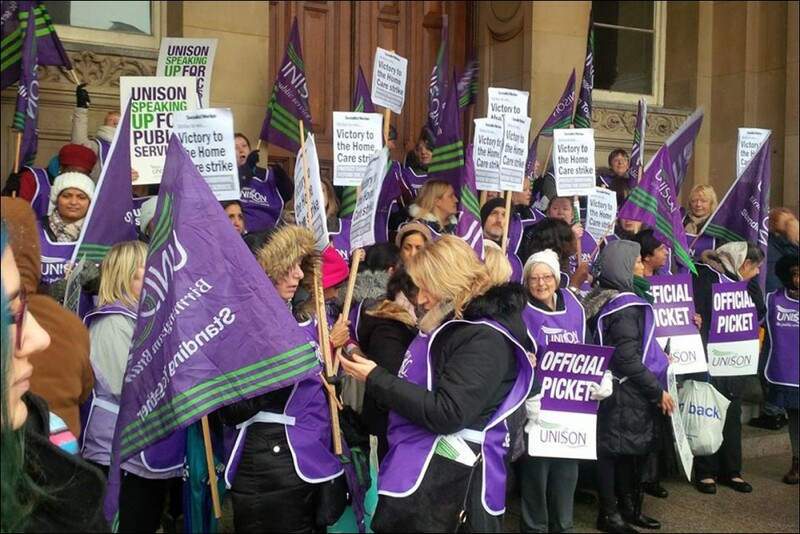 Home care workers should take inspiration from last year's bin workers' victory - when we fight, we can win! This version of this article was first posted on the Socialist Party website on 7 August 2018 and may vary slightly from the version subsequently printed in The Socialist.